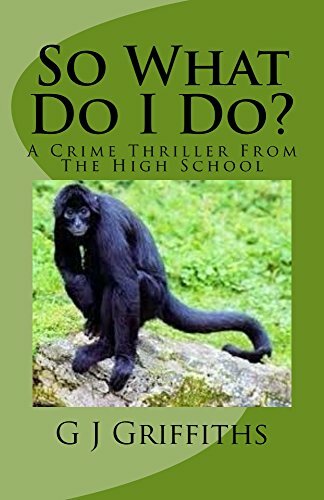 This is a thriller of the “How&Why’d they do it?” category and the book stands alone with its intriguing trail of catch-up between the police and the criminals. It’s in the “Columbo style” of a mystery where you see the crime committed then watch all of the recriminations unfold around it while detective Shantra pieces clues together and tracks down the felons. In So What Do I Do?, the third novel in the So What! series, we see the return of a few of readers’ favourite characters from the previous books. Constable Nigel Shantra returns as a detective, determined to bring to justice Kyle Crabbe, the psychotic adversary of his from the first So What! novel. And just what does a class of cheeky chimps, and a large black spider monkey, have to do with the traumatic events surrounding Hodgson’s Hide – the legacy of retired Technology teacher Gil Hodgson? Molly is back also, now as an experienced teacher and a new mum. She’s trying to come to terms with the major changes planned for Birch Green High School, while she and Oliver have dramatic plans of their own that could seriously affect both their careers. Still anxious to save the natural environment and its wildlife, Molly is also troubled by the plight of the neglected children of the world and climate change. Is she ever going to settle down to a blissful life of domesticity with her family when so many problems insist on grabbing her attention?